When I first got Buddy, he was sitting in my lap in the car and he never acted afraid. He just laid there looking up, staring at me. Even though he was only 5 weeks old, he was completely at peace in the car…never crying…and, eventually, he climbed up on my shoulders and slept touching my face. As he grew, he was always “curious”. He would come up on my desk, investigate the keyboard and just lay there, and start watching me work. He became my companion, my “Buddy”! He was so unique in that when I would throw a tin foil ball, he would catch it in midair with both paws! As an adult, he was still very laid back and continued to touch my face …but, the neatest thing was that he never stopped staring at me for long periods of time, as if he were just so in love. I always wondered what he was thinking and why he would seem so mesmerized by me. The attached picture shows the essence of this. I snapped his picture when I caught him staring at me again…it made me laugh and I wanted to remember it. He always made me feel so special and not alone, during the loneliest times. He knew when I needed him and he would always crawl up on me and just cover me with his love. 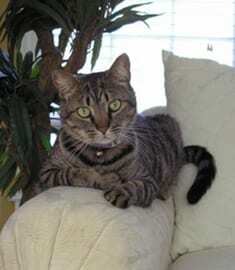 Buddy lasted just 8 precious years due to a hole in his heart and had heart failure. I was grieving so much, and not able to deal with his loss, and began searching on the internet when I came across ViaGen Pets. They immediately gave me instructions to preserve Buddy. I can’t tell you how much better it made me feel…it’s like he’s still there, waiting to come back now instead of gone forever. I have the hopes that with future technology, there is the chance of bringing my Buddy back and of repairing his heart, so that this time around he’ll grow to be an old Buddy… right along with me! Where there was only grief, ViaGen Pets has now given me peace and hope!